As can be seen on our club crest, Hitchin Nomads was founded in 1931. There were cycling clubs in Hitchin as long ago as 1875. These included the The Hitchin Cycling Club and the Blue Cross and Hitchin Rovers clubs. But at the start of the Thirties, there was only one active in the area – Letchworth Cycling Club, founded in 1928. It was during the winter of 1930-31 that moves to form a new Hitchin based club began, which eventually led to the foundation meeting being held on 4th June 1931 at 11 Bedford Road, the home of E.C. Tomkins. One of the eleven present at that meeting was Allan Porter, a name familiar from the two club trophies presented annually. The aims of the club were: to start from a social base (admitting women), hold regular Sunday club runs, weekend and holiday tours, acquire a clubroom, and mount a full programme of time trials on a weekday evening as well as at weekends. The first time trial was a five mile event, won by Norman Pearce at 24.62mph, and by 10th. April 1932 the club was running its own ten mile event on the Codicote road south of Hitchin. Maurice Sunderland was the winner in 30m 19s. Sunday club runs started at Butts Close and were extended up to 100 miles to places such as Burnham Beeches and Clavering. By 1935, club membership had stabilised at around 60. In July 1937, Peggy Harding became the club’s first and only national record holder when she broke the 25 mile record riding in a Hounslow club event. Inevitably there was a break for the war, but the club restarted in 1946 with 14 pre-war members present. The membership was strengthened in 1947 when the Letchworth CC was wound up and its members joined the Nomads. One of these was Alan Jarman, who in 1951 became the first club member to get under the hour in a 25. By that time, members were also establishing place-to-place records, e.g. Hitchin to Cambridge, and Hitchin to Yarmouth. The 1950’s were the club’s great years. 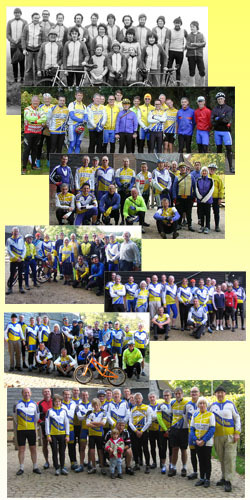 Touring was also becoming strong again and a “potterers” section was started – a run to Old Warden attracted 15 riders. However, the fortunes of the club took a nosedive in the early 60’s when membership dropped to only 27. By June 1963, club funds were down to a mere £2! 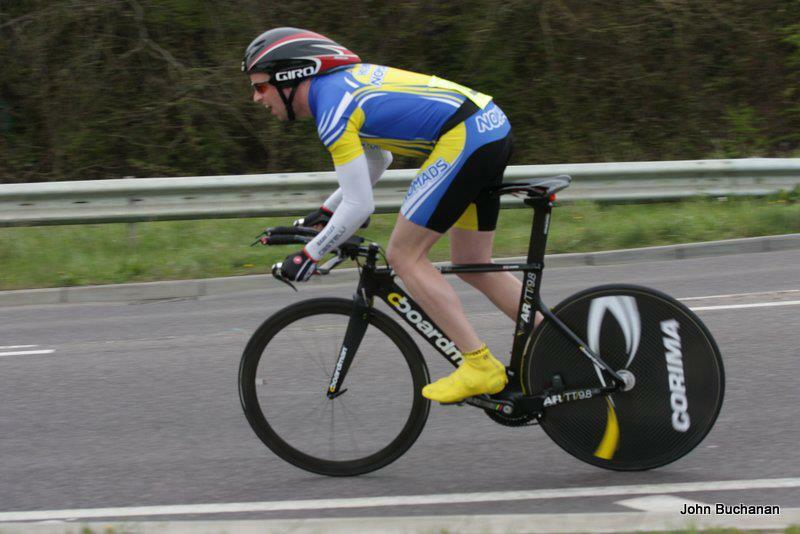 At this time road racing was predominant, time trialling being somewhat overshadowed. However, successes were to come in the late 60’s in hill climbing, when Max Pendleton (father of Victoria) and Colin Summerfield performed brilliantly to make the Hill Climb trophy their own for 15 out of 16 consecutive years. 1965 saw the start point for the club run move from Portmill Lane in Hitchin to the Arena car park in Letchworth, (where it remained until its move back to Hitchin in 1993). The reason for the move to Letchworth was simply that most of the members lived there. In 1975, the club colours were changed from green and gold to blue and yellow. That year also saw several key members of the club leave, and despite one evening 10 attracting no fewer than 51 entries, the club entered into another of its troughs. In 1976 the Nomads found a new and better clubroom at The Settlement in Letchworth and the following year, the club began to pick up again. Recent years have seen a rise in the numbers of young people joining the club (and not only ours). We have a wide range of events throughout the year and we have run a number of highly attended and popular Go Ride coaching sessions for local kids. Our Sunday club runs are very popular and tend to be the main opportunity for newcomers to see if the club is a good fit for them and their aspirations. Since the boom in popularity of the sport (from 2010 onwards) we have seen a good influx of new people. Today’s Nomads offers a range of events and races plus social and touring rides to cater for all number of abilities and interests. The club organises a packed time trial and sportive calendar and riders compete in open time trial events, road races and cyclo-cross and mountain bike races.